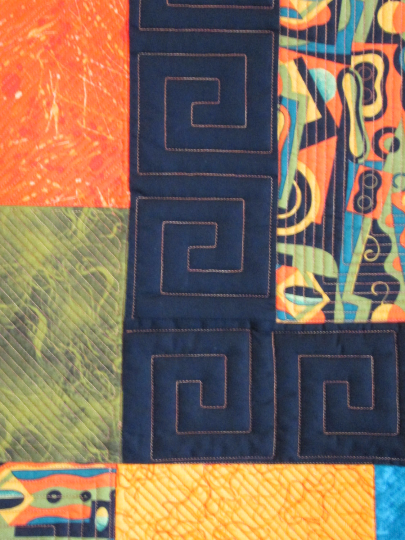 Offering this very modern abstract art quilt titled My Rendtition of Picasso; center and corner blocks are a very modern abstract print in teal, black, olive, orange, and yellow orange gold - quilted with a square spiral pattern; surrounded by a black border, quilted with a greek key border pattern. 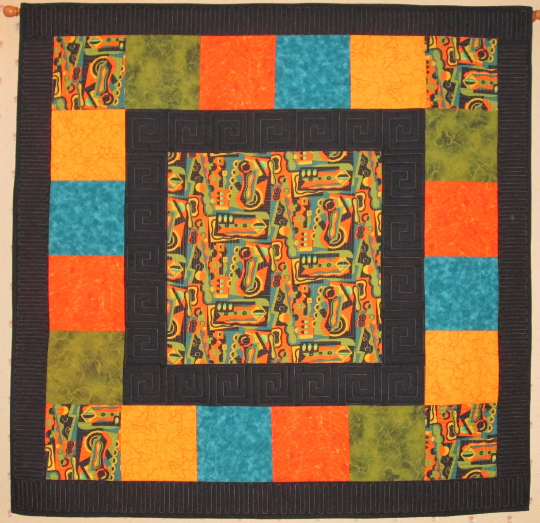 Adorned with blocks in teal marble, olive swirl, orange splash, and yellow orange print - quilted in diagonal lines. 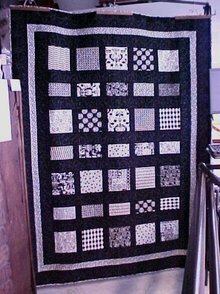 Outer black border is quilted with a linear line pattern. 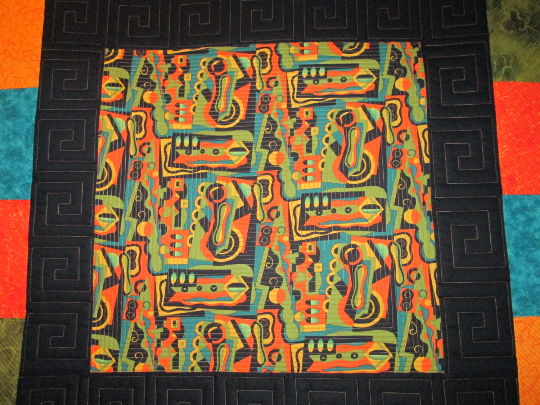 Threads are in an orange verigated, teal verigated and olive verigated King Tut threads. Measures 48" x 48". 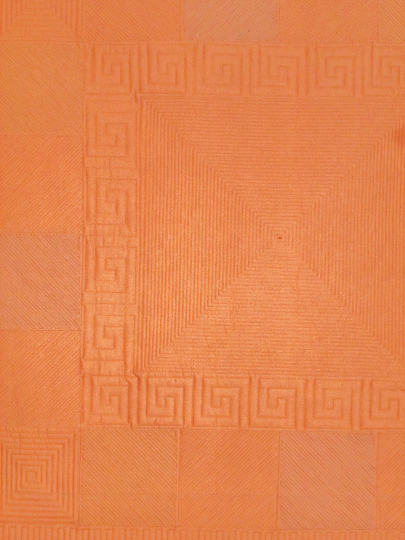 Bound with black fabric; backing is a rich salmon solid fabric. Comes with a hanging sleeve. 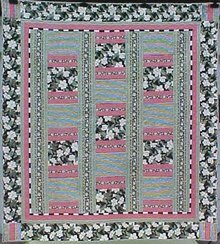 All fabrics are quilt shop quality; batting is 80% cotton/20% poly. 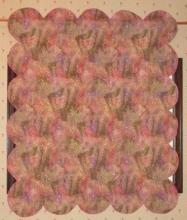 Designed, pieced and quilted in my quilt shop by me(in a smoke and pet free environment). Made in the USA. 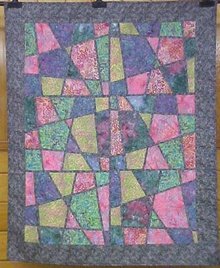 A one of a kind modern art quilt to compliment any room! International shipping quoted upon request. More photos available upon request. 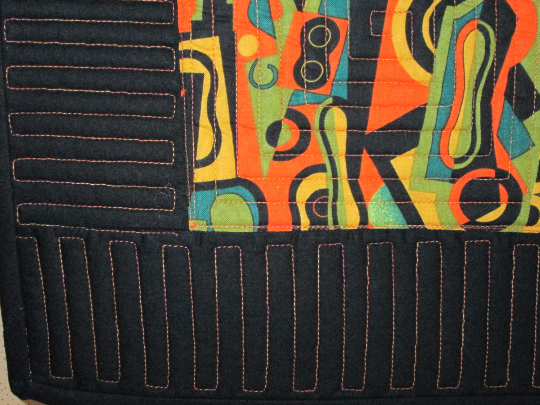 Items Similar To "Quilt Abstract Art Wall Hanging Black Orange Teal Olive Picasso"